While there’s much focus on storm surge risk in New Orleans as we mark the 10th anniversary of Hurricane Katrina, two new reports highlight the vulnerability of other U.S. coastal cities to storm surge flooding. An analysis by Karen Clark & Co ranks the U.S. cities most vulnerable to storm surge flooding based on losses to residential, commercial and industrial properties from the 100 year hurricane. The findings may surprise you. KCC reveals that some of the cities most vulnerable to storm surge flooding have not been impacted for decades. A few have not experienced a direct hit from a major hurricane in the historical record. Tampa/St. Petersburg, Florida is the metropolitan area most vulnerable to storm surge flooding, according to KCC, with a loss potential of $175 billion. Four of the top cities (Tampa, Miami, Fort Myers and Sarasota) are in Florida, and the west coast of the state is more vulnerable than the east coast. In fact, three cities–Tampa, New Orleans and New York–will likely have losses exceeding $100 billion from the 100 year event. 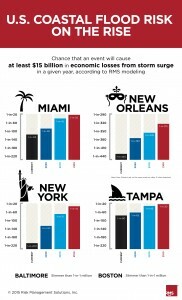 Meanwhile, a new report by catastrophe modeling firm RMS, took a look at six coastal cities in the U.S. to evaluate how losses from storm surge are expected to increase in the next 85 years and found that cities such as Tampa, Miami and New York face greater risk of economic loss from storm surge. To evaluate risk, RMS compared the chance of each city sustaining at least $15 billion in economic losses from storm surge–the amount of loss that would occur if the same area of New Orleans was flooded today as was flooded in 2005. Based on its findings, Tampa has a 1-in-80 chance of experiencing at least $15 billion storm surge losses this year, followed by Miami with a 1-in-125 chance and New York with a 1-in-200 chance. New Orleans still faces significant risk, with a 1-in-440 chance of at least $15 billion in economic losses related to a storm surge event, RMS noted. Looking ahead to 2100, the likelihood of those cities sustaining this level of losses rises dramatically. By then both Tampa and Miami will have a 1-in-30 chance of experiencing at least $15 billion in economic losses related to a storm surge event, while in New York the chance increases to 1-in-45 and in New Orleans to 1-in-315. Some 25 years after the Loma Prieta earthquake, the San Francisco Bay area faces increased risk of a major quake, two separate studies suggest. A study published online in the Bulletin of the Seismological Society of America says that sections of the San Andreas fault system–the Hayward, Rodgers Creek and Green Valley faults–are nearing or past their average earthquake recurrence intervals. It says the faults ‘are locked and loaded’ and estimates a 70 percent chance that one of them will rupture within the next 30 years. This would trigger an earthquake of magnitude 6.7 or larger, the study’s authors say. A second study by catastrophe modeler RMS says the next major quake could be financially devastating to the Bay Area economy in part because of low earthquake insurance penetration. RMS warns that a worst-case 7.9 magnitude earthquake on the San Andreas fault could cause over $200 billion in commercial and residential property losses, yet only 10 percent of households currently have earthquake insurance. Without insurance, homeowners may walk away after a quake if the residual value of their property is less than the outstanding value of their mortgage, RMS notes. Even those with insurance are likely to struggle to meet high deductibles, potentially leading to significant blight and disrepair in badly damaged neighborhoods. 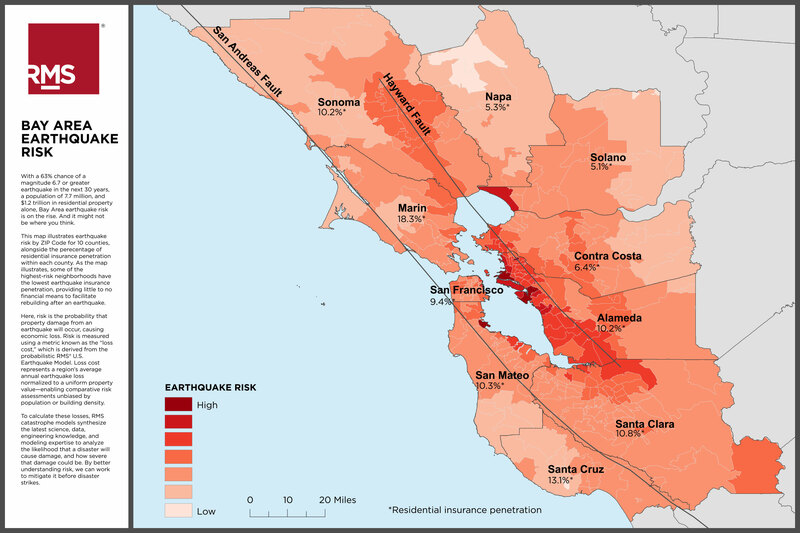 Despite low earthquake insurance penetration, a magnitude 7.0 earthquake rupturing on the Hayward fault could produce $25 billion in insured loss across residential and commercial lines of business, RMS concludes. A glance at the economic context shows that since the 1989 Loma Prieta earthquake, population in the Bay Area has increased 25 percent, while the value of residential property has jumped by 50 percent, reaching $1.2 trillion. The Bay Area is also the most productive economy in the U.S. with a gross domestic product of $535 billion, ranking 19th in the world compared to national economies, RMS says. Check out I.I.I. facts and stats on earthquakes. As we approach the peak of hurricane season, catastrophe modeler RMS has warned that storm surge poses a greater risk than hurricane wind. RMS says its updated North American hurricane model shows there is a 20 percent chance that storm surge loss will be greater than wind loss for any U.S. hurricane that makes landfall. AndÃ‚ for theÃ‚ northeast coast of the U.S. the risk is even higher. RMS’s updated North Atlantic hurricane model suite includes the ability to fully quantify the risk from catastrophic hurricane-driven storm surge. An earlier paper by RMS on Superstorm Sandy made the point that storm surge loss can drive more insurance loss than hurricane wind. Recent analysis by CoreLogic estimates that more than 4.2 million U.S. residential properties are exposed to storm-surge risk valued at roughly $1.1 trillion, with more than $658 billion of that risk concentrated in 10 major metro areas. According to I.I.I. facts and stats on flood insurance, Hurricane Sandy was the second costliest U.S. flood, based on National Flood Insurance Program (NFIP) payouts as of July 12, 2013.